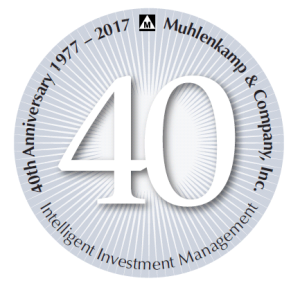 Announcements - Muhlenkamp and Company, Inc. 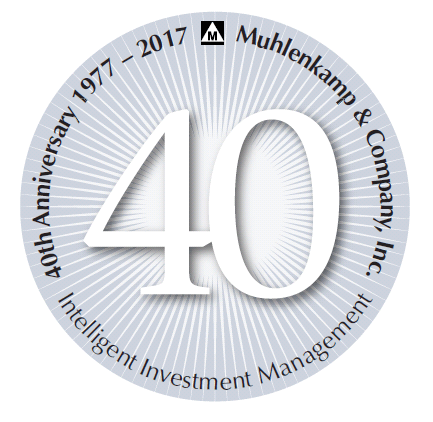 Announcements - Muhlenkamp and Company, Inc.
At the age of 75, Ronald H. Muhlenkamp retired from the investment management firm Muhlenkamp & Company, Inc. on February 15, 2019. After having been in the business of investing for over 50 years, he is passing on the day-to-day stock picking and portfolio management duties to Jeff Muhlenkamp. Ron remains the majority shareholder of Muhlenkamp and Company and will serve as the firm’s Chairman of the Board and Internal Economist. He plans to still be in the office studying and researching, but will be leaving the operational responsibilities to his sons, Tony and Jeff. Mr. Jeffrey P. Muhlenkamp has served as Co-Manager with Ron since November 2013, and has served as an Analyst since 2008. Jeff is the lead Portfolio Manager at Muhlenkamp & Company, Inc. as of February 15, 2019. Mr. Anthony W. Muhlenkamp has served as President and Chief Compliance Officer of Muhlenkamp & Company, Inc. since November 2013. Tony is responsible for setting the strategic course for the family business and continuing the vision of helping clients build a legacy of financial freedom.